Most scientists tend to become uneasy when the subject of 'evaluation' comes up. In a way, this is surprising, because science itself is a continuous process of evaluation. A scientist builds on knowledge acquired earlier. He checks and double-checks the thoughts, data and theories provided by his peers, both contemporary and from the past. And if he is any good as a scientist, he does the same with his own findings and results. The history of science is full of bitter disputes between famous men and women who falsified, or thought they could falsify, the results of their colleagues' work, their thoughts and data. However, in the last few decades a new element has emerged. The layman or bureaucrat, who meddles with matters that used to be solely the concern of scholars and intellectuals. Let me say something about my personal experience here. After a career of some eight years in physics, I became a member of the directorate of FOM, the physics branch of the Netherlands Research Council system. In short, I became a bureaucrat. This was in 1968, a sad year for Dutch physics because, for the first time in 23 years, the government did not increase the budget. The president of the Board told me that they expected me to engage in 'science policy'; difficult choices had to be made. It was the first time I had ever heard these words. I had to attend committee meetings in which budgets were allocated. At first, I was highly impressed, because these committees contained virtually all the outstanding physicists in the country (civil servants of small countries are privileged to have such experiences). I felt rather shy about my position. What could I add to all the wisdom gathered around those tables? But after a short while I became uneasy. There was no doubt about the personal merits of the committee members, but as a group they did not function well. That is, they avoided disputes and avoided making choices. Over the years, my role became clearer. With all the respect I owed them, I realized that I had to help them to use their expertise in making choices. I shall not relate here all the attempts, successes and failures. A number of them have been recorded and published2,3. Of course, we became interested in the possibility of using formal techniques such as publication counts. In The Netherlands, disputes about the validity and usefulness of such endeavors were as heated as elsewhere. A few years earlier, Eugene Garfield had begun publishing the Science Citation Index (SCI), which provided a rather interesting new tool. Instead of simply estimating the relative standing of the groups that were competing for the scarce funds available, one could now, apparently, look at the volume of their productivity in the past and get an objective indication of the use that others were making of their work. In 1972, citation counting was already popular for evaluation purposes. However, we had serious doubts about the general validity of this method. In materials science and in thermonuclear research, for instance, the views that peers expressed to us often diverged considerably from citation counts. While experimenting with the material, we soon found that we were dealing with a dangerous substance. The SCI is far from faultless. Its merits and shortcomings have been highlighted by many authors, not least by Garfield himself. Given the great interest in citations on the part of policy makers, we were surprised to discover that virtually no attempt had been made to investigate the reliability of citations as a means of evaluating research, research groups and institutes. We decided that such a test was absolutely essential. The Board of FOM, which was actually very skeptical about the potential of bibliometrics, gave us the means to carry out two extensive studies. They were designed and directed hy the late Jan Volger of Philips and myself. The real work was done by K. H. Chang et al.4 and by C. J. G. Bakker5. The first study dealt with research on magnetic resonance and relaxation during the period in which these fields could be considered of purely scientific interest. The second study covered the R&D on the electron microscope, that is, a subject of a technical nature. Both studies yielded valuable lessons that we were able to apply in policy making. It was not until many years later, when Antony van Raan invited me to contribute a chapter on these early studies to the second Handbook of Quantitative Studies of Science and Technology6, that I took the opportunity to present them to a learned public of scholars of science and technology, a new branch of social studies that emerged in the 1960s 7. Chang and Bakker used several methods of evaluation, among them peer review, including written reviews and cross-interviewing and they looked at textbooks, publications, citation to patents, patentcitations and honorary awards. Finally they compared the results. Since the 1960s, many people have used the technique of comparing similar groups by a variety of methods. Possibly the best known evaluators are Martin and Irvine, who have carried out studies in several countries. Their first findings, about radio astronomy institutes, were presented at a conference in Yugoslavia8. In a by no means exhaustive literature search in 1989, we counted about 30 papers authored by this productive duo. Among the earlier attempts at evaluation with a multiple methodology, we should mention the work of Anderson, Narin and McAllister9. These techniques have now become standard practice. Lesson 1. When evaluating research, one obtains the best results by applying different evaluation techniques simultaneously. In the case of decisions concerning the allocation of funds, evaluations comparing the achievements of groups or institutes that are similar to each other generate the least controversy. The subjects to be compared should be, as far as possible, of the same nature. Lesson 2. Chang's work led us to the conclusion that the bibliometric evaluation technique of citation analysis is highly reliable as far as a purely scientific subfield of physics is concerned. The technique was tested so thoroughly and extensively and the results were so consistent that we feel justified in generalizing: Citation analysis is a fair evaluation tool, for those scientific subfields where publication in the serial literature is the main vehicle of communication. The method is cheap to administer and fast. Nevertheless, citation counts should not be used on their own. Results should also be discussed with peers in the field, and policy should not be decided upon before the groups involved have had a chance to check the outcomes of the studies. There are too many pitfalls and possible sources of error and injustice for citation counts to be relied upon completely. As the father of quantitative studies of science and technology, Derek de Solla Price, used to say: 'Bibliometric studies may help to keep the peers honest'. And - I would add - frank. Lesson 3. In the case of a technological subject � the electron microscope � SCI analysis proved to be insufficient for evaluation purposes. This conclusion was based on analysis of patents and patent-citations as well as peer review, which gave additional valuable information. The outcomes of citation studies were often at variance with the consensus resulting from the other techniques. Reliance on citation studies alone would have heen misleading. We feel justified in generalizing this result also: In technology or applied research, bibliometrics is an insufficient means of evaluation. It may help a little, but just as often it may lead to erroneous conclusions10. We were tempted to elaborate on the subject. Many fans of bibliometrics were not too pleased with our conclusions. There is a tendency among the adherents of bibliometrics to oversell the potential to authorities in an attempt to acquire research contracts. We had demonstrated shortcomings. We had proved that technological work could lead to a lack of bibliometric recognition, but we felt that we would only really contribute to the understanding of the 'citation gap' in technology if we succeeded in measuring it. This may seem an impossibility: to measure the number of citations that were not given! It occurred to us that the outcome of the intellectual activity that we call research, ought to be a document, a piece of work that other skilled people can decode and understand. This is a more general notion than the conventional idea of books or scientitic papers as the output of research. Archeologists may not be surprised at the idea, but in most other fields of science the thought is new. In particular, if the outcome of research is a new or improved scientific instrument that can be attributed to certain identifiable 'authors', there is a 'document' that we could try to trace. When someone uses the instrument in his research and mentions this in his scientific papers, we are dealing with a true 'citation'. The electron microscope developed in The Netherlands provided us with an opportunity to measure the citation gap. The work was done by W. P. van Els and C. N. M. Jansz. and published in 198911. Citation counts of the main authors of EM200, EM300 and EM400. by extrapolating from the data obtained from a sample of 727 papers. credit of Ruska and Von Borries that they accomplished this feat in the early 1930s, when they built the first electron microscope. This outstanding development was fully recognized only in 1986, when Ruska was awarded the Nobel Prize. In The Netherlands, research in electron microscopy began in 1939, initiated hy Le Poole at Delft Technical University. The success of this group soon led to collaboration with the Philips Research Laboratory and with the Organization for Applied Scientific Research, TNO. The three then worked together to develop a practical microscope. First of all, they produced an experimental 150 kV prototype. This was followed by a commercial instrument, the Philips EM100. Both types incorporated a number of important innovations developed by Le Poole. Further developments led to the EM200, which appeared on the market in 1958. This was the first electron microscope to threaten Siemens' hegemony in the field. More than 400 of the EM200 models were built before production ceased in 1965. The successors, the EM300, introduced in 1966, and the EM400, available since 1976, were even more successful. For practical reasons, we restricted our study to the EM200. EM300 and EM400. Most of these instruments are still in use today and it is known who made the principal contributions to their development. Philips agreed to provide the names of those who had purchased the three instruments. This unique sign of trust and confidence cannot he overestimated; without it we could not have carried out this study. Using standard sampling techniques. we selected a number of purchasers whom we asked for lists of their publications. This provided us with a database of 5,073 publications, from which we selected, again by random sampling, 727 papers which our team actually read. Table 1 contains information on the citation counts of the main authors of the electron microscopes. 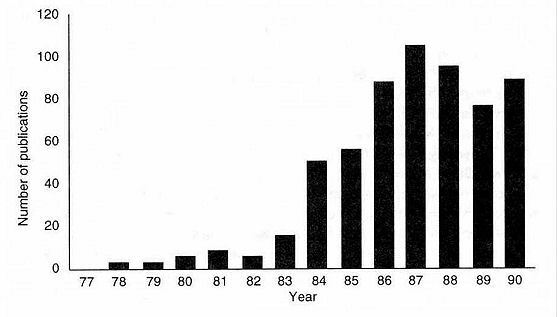 We have compared the normal citations in the scientific literature, as provided by the SCI in the period 1981-85, with these found by us as textual citations of the instruments (instr. in Table 1). Garfield12 lists the 250 most cited primary authors in the 1984 SCI. Their citation rates range from 448 to 11,009. The average annual citation rates for our authors range from 294 to 1,267. Thus, with the exception of Le Poole, Van den Broek and Van Dorsten, the 'authors' of the three microscopes fall within the 250 most cited in the SCI of 1984. Even the score of the three others is high; one should realize that 'the publication' they authored originated in 1958 and was thus a so-called 'citation classic' by 1984. The SCI figures that we used refer to the work of an author in its entirety, whereas our study considered only three instruments. In the case of van Dorsten and Ie Poole in particular, references to other work would lead to considerably higher counts. The estimates presented are conservative, but nevertheless the size of the citation gap is striking. All the scientists involved belong to the citation ranks in which virtually all Nobel Prize winners are found. We have explored other fields of technology in a more or less similar way. Again, we have chosen topics for which we have access to the necessary but otherwise inaccessible background information. These topics include the development of the storm surge barrier in the Eastern Scheldt, a revolutionary civil engineering innovation, and the stabilizers developed by the Technical Physics Institute (TPD) in Delft. Some of these studies have been published. They all confirm the general pattern: innovative technology leading to artifacts and with a follow up in normal science are bibliometrically nearly invisible. In the case of the Eastern Schelde, we conducted a search in various literature databases. The results are shown in Table 2. The authors with higher publication and citation counts all work in more fundamental areas. The bibliometric invisibility of the technologists cannot be attributed to lack of written material, but to the nature of the documents that they produced. Numerous reports were produced in-house in many of the organizations involved in the project. The reports are accessible, but are not considered by data services as part of the open literature. Many reports are written in Dutch. Last but not least, many of the written documents we traced did not even bear the names of the authors. Here, we touch again upon important cultural differences between scientists and technologists13. However, several of the non-cited authors have been awarded high scientific honors for their contributions to the barrier. Citation counts: storm surge barrier. Citation (1) and publication (2) counts taken from the Science Citation Index. Publication counts taken from the bibliographic databases INSPEC (3), COMPENDEX (4) and PASCAL (5), for some of the contributors to the Storm Surge Barrier in the Eastern Scheldt. Names of principal contributors are underlined. We distinguished the following fields: pd = probabilistic design, co = coastal engineering, sh = soil hydraulics, ci = civil engineering, pm = program management, sm = soil mechanics, ee = electrical engineering, me = mechanical engineering, mb = marine biology, ec = ecology, gt = geotextiles, he = hydraulic engineering. In the case of the stabilizers developed by the TPD in Delft and used in the astronomical satellite IRAS, we are dealing with a unique precision device, without which none of the IRAS measurements would have been possible. Figure 1 shows the number of publications found in the scientific databases with `IRAS' as the search-word. None of these originates in the technical sciences. They are all astronomy papers, none of which refers to the new stabilizers. Interestingly enough, the technologists of the TPD themselves were totally unaware of their citation gap! Publications with 'IRAS' as search-word. There are several options for further studies, among them the developments around ARALL/GLARE, a new construction material for aircraft, and modern developments in micro-electronics. An interesting example from the latter field is electron migration, the phenomenon in which the momentum of electrons in current carriers causes displacement of the lattice atoms in the carrier. This effect has been known for some time and is acquiring increasing significance. With the shrinking of circuits, miniaturization, and the increase in current densities, research is intensifying. However, we are seeing a marked decrease in publications and citations. It is a matter of competition and commerce, of course. The higher the value of the research, the less likely it is to become a citation celebrity. The main actors in the Delta Project � the unique civil engineering project of which the storm surge barrier was a major part � have not shown any craving for fame or acknowledgment via publications. Many of them have simply forgotten that much of their early research was actually written up and is still available to someone prepared to search hard for it. Anyone contemplating a similar endeavor can examine the documentation � all twelve kilometers of it - and talk with the engineers, who are willing to tell all they know. He should bring a cubic meter of notebooks with him. But better still, he should hire some of the engineers as consultants, as many governments do. Just as in other branches of science, when you want to start a productive scientific institution you do not begin by building up a library. First of all, you try to hire good scientists. And in this field you will not find them by counting citations. Despite all my reservations concerning formal evaluation techniques, I do not suggest that they be done away with. In those branches of science where all the players agree that publication in the serial literature is the major form of communication, citation counts are powerful policy aids. Again, a story from my personal experience. As an administrator, I soon discovered that if you ask people who is an expert in such and such a field, they have a tendency to cite persons who are their own age or older. When I did some homework first, fiddling around with our citation data, and I mentioned some rising stars, the reply would often be something like 'I'm surprised you know him. He is indeed an interesting up-and-coming scientist. He wouldn't be a bad choice.' Among conservatives, I found it would be better for me to bite my tongue off than to say I got the idea from my citation records, since this often elicited considerable scorn on their part. Our knowledge of publication and citation records has really improved the composition of our committees and the nature of our advisory apparatus. Previously, we sometimes came up with the name of someone whose only contribution to science had been the editing of conference proceedings or a book with tables or other data sources. Sometimes the suggested expert had died years earlier. We have also used publication and citation data to evaluate candidates for promotion or senior appointments. But in all these cases, we have avoided relying on citations and publications alone and have used them simply to help us formulate questions for peer groups. We have never allowed formal evaluation to be the decisive criterion. The group led by A. F. J. van Raan and H. F. Moed at Leiden University has made extensive use of bibliometric material in the evaluation of research groups. They also have taken care to avoid the many mistakes that rough citation counts may cause. They have never used their results in policy recommendations to the board of the university or to faculties without first acquainting the groups with their preliminary findings. By doing so, they have acquired a good reputation in the faculties, and their studies have been instrumental in bringing about budget shifts and the reallocation of personnel. Their performance recently won them recognition from the Central Research Council in The Netherlands, NWO, which has given them a contract to extend their studies to other universities. I have always opposed or discouraged the use of bibliometrics for the evaluation of work in technical universities. The technological branch of the Netherlands Research Council is the only branch whose annual report does not list the publications that stem from the projects which it supports. The board is favorable to publications but only if they do not impede the major task � that is, the transfer of knowledge to quarters that can make use of it in a practical way. The board maintains an active patent policy. Patents are, of course, publications in their own right. But we all know that such publications do not increase a person's scientific visibility. Patent citations are rare, and it is certainly more difficult to get reliable statistics. F. Narin and his colleagues at his small company, Computer Horizons, are doing interesting work on patent statistics and patent citations. Such work provides some insight into the strengths and weaknesses of technology at the national level. It may also help companies with substantial patent portfolios to evaluate their acomplishments and those of their competitors. But this work is of little use in the systematic evaluation of research groups in academia. Technology is not confined to technical universities. Many groups in regular universities and in public research institutions, that have been set up for basic science, do interesting things of an applicable nature. Whether they perform well as technologists depends just as much on the quality of their work as on the effectiveness with which they succeed in transferring their results in a practical way to their 'users'. When evaluating their output, one should bear in mind that knowledge transfer other than via scientific papers requires considerable effort. This effort takes time, is labor intensive. and cannot be traced bibliometrically. It could be very damaging to such groups or institutes if policy towards them were determined on the basis of their publications and citations alone. Grant requests to STW, the technology branch of the Netherlands Research Council, can be submitted all year round. Applicants must have a tenured position in a Dutch university. Grants may cover all direct costs for research such as salaries for additional personnel, materials, instruments and travel. Proposals differ from similar proposals to other research councils in that they have to contain a paragraph in which applicants explain how they intend to promote the outcome of the research for practical use outside the particular field of science in which they work. Program officers of STW send each proposal to five or more referees active in public and private research related to the proposal, with the request that they explain, why they think the proposal is good or bad and whether they think the proposed utilization is wise and, if so, why. Suggestions for improvements are encouraged. The anonymous comments received by STW are forwarded to applicants, who may comment and answer questions. When 20 proposals from different fields of technology have been reviewed in this way, STW appoints an ad hoc lay jury consisting of 11 people from universities, other government institutions, and private companies. They receive the 20 proposals with the referees' comments and those of the defendants, and they are asked to assign each proposal two scores � one for scientific merit and one for the likelihood of useful utilization. In the final rating, the two marks are given equal weight and combined. (In reality, the jury consultation is a two-round DELPHI procedure in which there is opportunity for question and answer. However, juries do not meet, and only valid arguments are distributed among the members.) STW usually funds the top eight of the 20 proposals. STW has great confidence in this system, which has been in operation since 1980. Elsewhere, we have reported on the internal consensus and the consistency of the juries' judgements14. Recently, we have obtained reliable statistics about the predictive value of the juries' judgments concerning the likely applicability of research results and the ultimate real outcome of projects15. 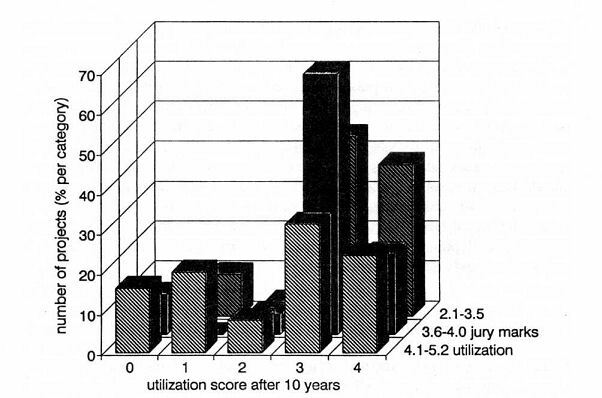 They show that juries do have great predictive talent. the ultimate outcome of research projects after 10 years. 4 A private company is commercializing the results of the project. STW and the company have signed a contract, involving royalty revenues for STW. 3 A company is using the research results in products or processes; there is no contract, though there may be occasional revenues. 1 As in category 2, but without user contribution. 0 No private firm uses the results. It should be noted that this last category also includes projects that did find a user in the non-profit sector, such as public health or state civil engineering works. It is clear from this figure that the grant selection procedure correlates strongly with the final outcomes of projects. Currently, we are trying to investigate the validity of jury judgements concerning the scientilic quality of research projects, using comparisons with bibliometric evaluation techniques. have been made, Nieuwegein, 2008 08 27. The author retired from STW. M.S. Frankel & J. Cave: Evaluating Science and Scientists, Centr. Eur. Univ. Press Budapest 1997. C. Ie Pair, 'Decision making on Grant Applications in a Small Country'. Scienlifica Yugoslavica. Vol. 6 (1980), Nos. 1�4, pp. 137�43. C. le Pair. 'Managgiario in Distante', in J. Kistemaker (cd. ), Management of Science (Amsterdam: North-Holland, 1982). K. H. Chang, D. Dicks, P. Edelman, 'Evaluation of a Subfield of Physics: Magnetic Resonance and Relaxation Studies', in The Studies in the Nerherlands. FOM-37175, (Utrecht: FOM. 1975). C. J. G. Bakker, Elektronenmicroscopie in Nederland, FOM-43105 (Utrecht: FOM, 1977). A. F. J. van Raan (cd.). Handbook of Quantitative Studies of Science and Technologe (Amsterdam: North-Holland, 1988). C. le Pair. 'The Citation Gap of Applicable Science', in van Raan (cd.). Handbook of Quantitative Stdies, op. cit., pp. 537�53. J. Irvine and B. R. Martin, 'A Methodology for Assessing the Scientific Performance of Research Groups'. Scientifica Yugoslavica, Vol. 6, Nos. 1�4 (1980), pp. 83�95. R. C. Anderson, F. Narin and P. McAllister. 'Publication Ratings versus Peer Ratings of Universities', Journal of the American Society Jr binformation Science. Vol. 29, No. 2 (1978), pp. 91�103. C. le Pair, 'The Evaluation of R&D Programs in the Netherlands', in G. Boggio and E. Spachis-Papazois, Evaluation of Research and De velopment (Dordrecht: Reide) Publishing Co., 1984). W. P. van Els, C. N. M. Jansz and C. le Pair, 'The Citation Gap Between Printed and lnstrumental Output of Research: The Case of the Electron Microscope'. Scientometrics, Vol. 17. Nos. 5�6 (1989), pp. 415�25. E. Garfield, 'The 250 Most Cited Primary Authors in the 1984 SCI, part 1. Names. Ranks and Citation Numbers', Current Contents, 1986, No. 45, pp. 3�1 1. C. N. M. Jansz and C. Ie Pair, 'Information Instrumentation', in Institute for Advanced Optical Technologies, Invisible Connections; Instruments, Institutions and Science (Washington DC: Society of Photo-Optical Instrumentation Engineers. 1992), pp. 73-82. F. v. d. Beemt and C. le Pair, 'Selecting Grantees', Research Evaluation. Vol. 1, No. 1 (1991). Profiteren van Kennis, STW-report, STW-1993 05 03�8/1 (Utrecht: STW, 1993).